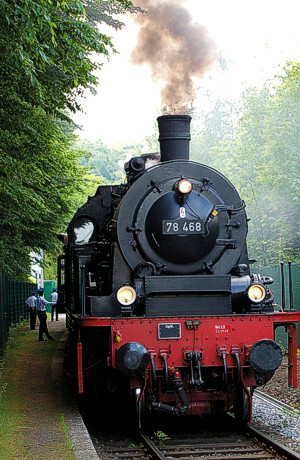 Travelling nostalgically like during grandpa's days - the Ruhrtal-Bahn is scheduled to run from May to October on the line built in 1874 from the Eisenbahnmuseum (train museum) Bochum-Dahlhausen to the Hagen main train station. The train runs on additional dates in April and for the close of the season in November. In December, the popular St. Nicholas rides are offered. On every Friday and Sunday, the rail bus from the 1960's travels the entire section roundtrip three times, except when the steam engine runs. The steam engine belonging to the train museum in Bochum-Dahlhausen runs, likewise three times, on every first Sunday as well as on some holidays between April and November. The lovingly restored wagons built between 1903 and 1955 radiate their irresistible charms, regardless whether one takes a seat on the rustic wooden benches or in the modernized compartments with synthetic leather seats. When the weather is good, it is worth taking fresh air on the open platforms and breathing the steam bellowing from the snorting engine. The rail bus is captivating with its cosy ambience and its unique panoramic view, which provides a completely different picture of the route. You can, of course, enter and exit the rail bus at the ten stops. Continuation of the ride or a return is possible with the next train. The trains have food service and tickets are available from properly uniformed conductors at the trains - just like in the "good old times." Baby carriages and bicycles can also be taken on board. The Ruhrtal-Bahn trains can also be chartered for private rides.